This is an age-related disease as the name implies. The macula is the centre of the retina and is the area that gives us reading and central vision. The cells in this area work constantly and excrete a lot of waste products that are continually cleaned up by surrounding cells. As we get older, this "clean-up" process is not as good in some people, and waste products may start piling up forming deposits called drusen. This is what is called "dry" macular degeneration and may cause some blurring of reading vision. Dry macular degeneration is very slow to progress and is treated with vitamin therapy (eg. Vitalux AREDS ® 1 tablet twice daily or Vitalux Plus ® 2 capsules twice daily - special formulation available for smokers or recent ex-smokers). When the waste products pile up too much for the macula to handle, the underlying Bruch's membrane may form breaks. These breaks lead to the formation of new blood vessels that can bleed and cause sudden, dramatic vision loss. This is called "wet" macular degeneration. It can lead to severe loss of reading vision. However, peripheral or side vision is still okay, therefore people with this condition may not be able to read, but can usually see well enough to get around. There are various treatments for wet macular degeneration, including injections of a drug that prevents new blood vessels from forming (eg. Lucentis ® or Avastin ®). There are also some types of macula laser that may be helpful. 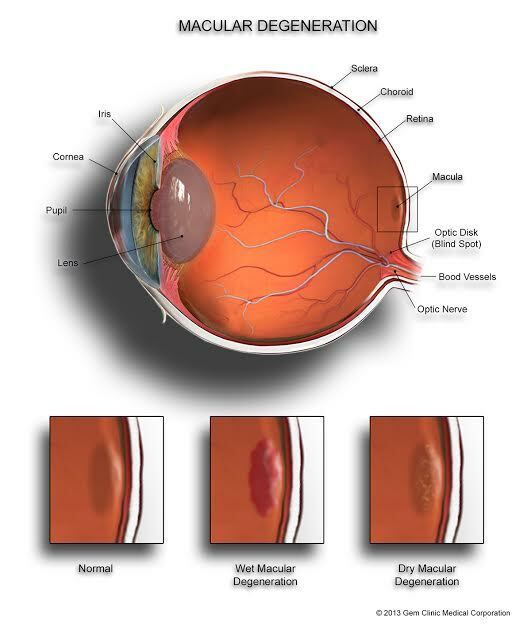 If you have wet macular degeneration, you will be promptly referred to a retina specialist who can assess you, review the treatment options with you and perform the necessary treatment(s). Follow-up with your regular Ophthalmologist (at GEM clinic or elsewhere), Optometrist or your retina specialist is always important with any of these problems.